The character Caillou is popular with preschoolers around the world thanks to the television series by Cookie Jar Entertainment. The show airs on various stations including PBS and Sprout. In the television series, Caillou is a preschool-aged boy that goes on adventures and learns about the world around him. But I bet some might be surprised to learn that the TV show is based on a series of books by Christine L'Heureux and illustrator Hélène Desputeaux. That's right, in the books he was originally a nine-month-old baby, hence the bald head. His name comes from the French word for pebble. The Caillou series of books were created to help parents and young children discuss troubling situations and talk about their emotions. We own a couple of books in the Caillou Little Dipper series (2-4), and there are a number of different Caillou series collections based on age groups from birth to the age of six. My kids have not watched the TV show because it does not air on our local PBS station, but they are familiar with Caillou from reading the books. Recently, we received a couple of Caillou toys for review and the toys have been quite popular in our home, especially with my son. Both toys are manufactured by Famosa / id toys. 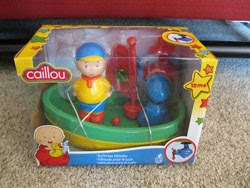 Although we have several bath toys, this Caillou Bathtime Toy Boat is currently the favorite bathtime toy in our home. At a price of only $16.99, I'm pretty impressed by how well it is designed and constructed. The green and yellow boat is about 9 inches long and 5 inches wide, floats well in water, and is easy to clean. The boat comes with two removable figures, Caillou and Rexy the dinosaur as well as a red sail. 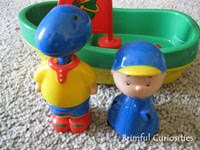 Kids can disassemble and reassemble the Caillou and Rexy figures, and exchange the tops and bottoms to make funny looking Caillou-dino creatures. I love how this interchangeable design feature adds another level of imaginative play to the toy. However, the thing that is really neat about this boat is that it has a removable wind-up propeller motor that spins. The motor does not require batteries but operates mechanically and it instantaneously mesmerized my son as soon as we opened the package. I took a video of my son playing with the toy for the first time so that you can see how easy it is for a child to turn the motor key. In the video, my son also demonstrates how to reassemble the Caillou figure (he was a little worried that the figure was broken). The propeller is strong enough that it does propel the boat ever so slightly forward in water, but even if it didn't move the boat, the propeller is still really interesting to watch spin underwater. Because the motor is fairly large, you'll need at least 5-6 inches of deep bathwater when the motor is attached to the boat so it won't touch the bottom of the tub. 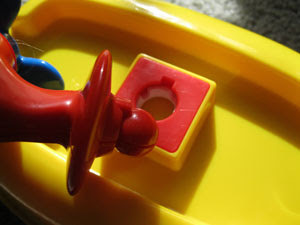 My son did have difficulty at first putting the motor on the boat because the motor has a notch that must fit in a slot on the bottom of the boat. Also, my daughter has really long hair and sometimes strands will fall off into the water during bathtime. We've noticed a few hairs wrapped around the propeller shaft, but I've been able to remove them so far. It does look like the propeller comes apart for cleaning if you remove five screws, but I haven't needed to take it apart yet so I can't truly verify that you'd be able to fix the propeller if it froze for good. Even for kids that haven't seen the Caillou show, this is a wonderful, affordable bathtime toy that I would not hesitate to purchase as a gift for a child. As far as bathtime boats go, it's a winner in our book. My kids love playing with the boat both in and out of the water and the propeller mechanism is really fascinating. 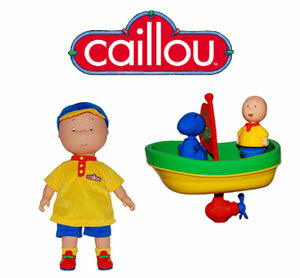 The huggable Caillou doll has a soft cloth body and plastic arms, legs and head. It retails for $29.99. Caillou's clothes are all removable, including the socks, shoes and hat. The shirt fastens together at the back with a long strip of velcro and the shorts have an elastic waist, so kids shouldn't have too much difficulty dressing the doll. Children will most likely need to ask for assistance from an adult to place the shoes on the doll. This is a well-made doll perfect for young children. My son never had much interest in doll play until he saw Caillou. 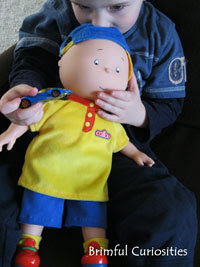 He likes that Caillou is a boy doll and is now willing to play dolls with his sister, though he prefers that his doll does "boy" things like play with cars! My daughter LOVES Caillou. As a matter of fact, her choice for a baby name if it is a girl is Rosie - Caillou's sister! I always wondered why Caillou was bald. My oldest two used to love this show. Sadly, my youngest two just never got into it. The toys do look like fun though! that is a great review.. My little one loves Caillou.. THanks for sharing this..